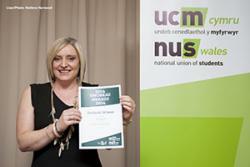 Bangor Students' Union not only won the Course Rep of the Year and Union Staff Member of the Year categories at the annual NUS Wales Awards this year, but also scooped the Higher Education Students’ Union of the Year category. 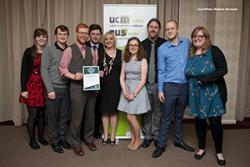 The Students’ Union won the Students’ Union of the Year award in recognition of the Union’s wide-ranging work this year. This includes an increase in clubs and societies participation, growth in the Course Representative system and the expansion of Student Volunteering. 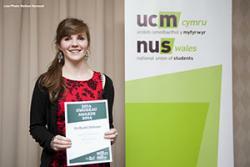 Hannah RettieHannah Rettie, 21, from Abergele, a third year student in the School of Psychology, won the ‘Wise Wales Course Representative of the Year’ Award. She was nominated for her work as a Course Rep in Psychology where she has increased student feedback, taking a proactive approach through on-line surveys and social media. Hannah also worked with the School on their National Student Survey action plan and has been helping to create a ‘you said, we did’ noticeboard in the school, which is used to tell students how their feedback is being acted upon. Delighted with her award, Hannah said: “I am so shocked that I won this award, I really wasn't expecting it! I am so grateful for everyone that nominated me, thank you so much! Alison RobertsAlison Roberts, a member of the Students’ Union staff, won the Simpson/King Staff Member of The Year award. Alison was nominated in recognition of her MiDAS minibus testing – a role that allows students to drive SU minibuses for student-led clubs, societies and volunteering projects. Professor Carol Tully, Pro Vice-Chancellor, said: "The SU's win is a reflection of the hard work they do on behalf of students at Bangor. We work in partnership with the SU team on a wide range of projects and we are very pleased to see this work recognised at a national level. Congratulations to all!" Also nominated in the ‘Student of the Year’ category were Christopher Bibby, Masters student in the Business School, and Trefor Alun, PhD student in the School of Welsh.